A charachterful two bedroom detached thatched cottage with a large west facing garden backing on to open fields, detached barn with garage and stable plus driveway with parking for several vehicles and horse box. Situtaed adjacent to the A480 and approximately 4 miles west of Hereford cathedral and city centre. Internally this traditional Black and White property offers well proportioned accommodation with modern style kitchen/breakfast room, four piece bathroom suite, gas central heating log burner in the living room and beautiful far reaching views towards the Black mountains. A genuinely unique opportunity to purchase a **CHARACTER BLACK AND WHITE THATCHED COTTAGE**, packed with original features, private rear garden, far reaching views, 2/3 receptions including sun lounge, 3 bedrooms, Inglenook/ wood burner - only 10 minutes into central Hereford. This is a delightful and pretty Thatched Cottage on the outskirts of Hereford in the tiny hamlet of Stretton Sugwas, close to Credenhill and the famous Hereford Horse Race Track. Its location is excellent, being close to the exit routes to the north and south of Hereford, but also affords the property outstanding views from the rear, stretching as far as the Brecon Beacons to the west and Credenhill to the North. Even in Herefordshire, it is rare for thatched cottages to come on the market, so this is a genuinely unique occasion. The property enjoys a warm and characterful feeling and is entered from the back via a lovely period door into the dual aspect, large sun lounge providing views out to the manicured rear garden, with further access into the kitchen and dining room. The kitchen feels traditional and warm with its natural wood units and benefits from a breakfast area with space for a four seat dining table, perfect for casual dining. Just off the kitchen is a family sized bathroom with walk in shower. There is also a separate WC. The dining room to the rear, lends a more traditional eating space and sits well within the house leading to the lovely, large, character lounge, resplendent with exposed stone walls and large Inglenook fireplace with embedded wood burner. 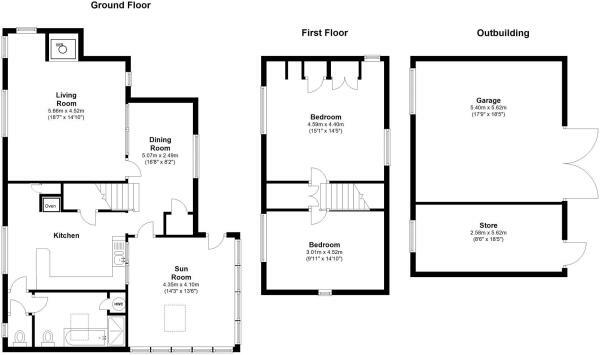 Upstairs the property has two good sized double bedrooms, one to the front and one to the rear. Outside of the property is a gravel driveway with ample parking for multiple cars. The driveway leads round to the rear of the house and allows very easy access to the back door. Off the driveway is a large brick built, tiled roof outbuilding, useable as a double garage, store of even stabling. To the rear and sides is the lovely, large, mature garden with far reaching views to the south west and north west. The garden contains fruit trees, as well as flowering borders and lawns, as well as a brick build shed and wood gazebo. Further features include mains access to gas, water and electricity. All heating is gas driven with GCH throughout. Windows are mainly double glazed. The thatched roof is in excellent condition, with the central ridge newly maintained in 2017 to include new netting in the same year. Disclaimer - Property reference 752. The information displayed about this property comprises a property advertisement. Rightmove.co.uk makes no warranty as to the accuracy or completeness of the advertisement or any linked or associated information, and Rightmove has no control over the content. This property advertisement does not constitute property particulars. The information is provided and maintained by Northwood, Hereford. Please contact the selling agent or developer directly to obtain any information which may be available under the terms of The Energy Performance of Buildings (Certificates and Inspections) (England and Wales) Regulations 2007 or the Home Report if in relation to a residential property in Scotland.